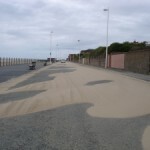 Thanks to those of you who alerted me to the problem of drifting sand down on North Parade again. 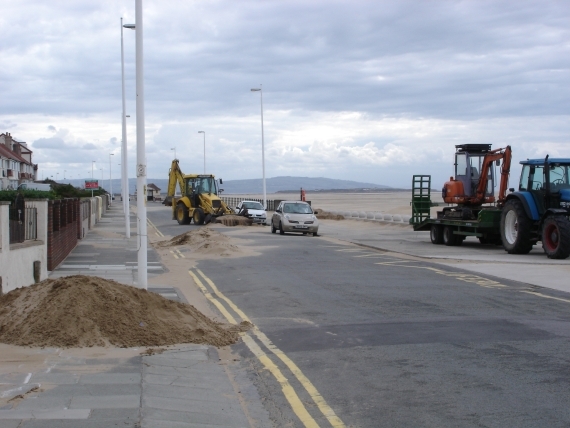 The breezy conditions caused the dry, fine sand to be blown off Hoylake beach and onto North Parade. I’ve been informed that cars were getting stuck (for a short while) in the sand and drivers have been making diversions around the side roads and pavements to avoid getting stuck. 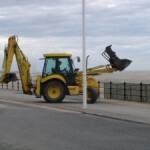 I took the above photo at around 5pm and as you can see a JCB was being used to scoop up the sand. It was either being dumped over the railings and back onto the beach or being dropped at the old Hoyle Road slipway next to the model boating lake. 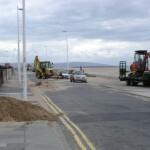 It seems that the drifting sand is becoming more of a problem – I’ve mentioned it before of course. What will it be like come the autumn with the typically strong winds? 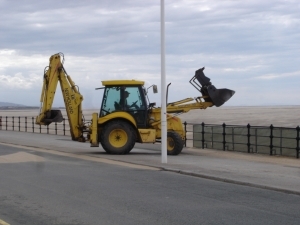 We need to be careful as certain Council Officers want to turn Hoylake into Parkgate to stop the sand coming onto the Prom and are keen for the grass to grow. Most of us who are born and bred here want it to be golden sand and we must keep on fighting to keep it so. I used to go on all the Spartina digs in my youth and even organised my own one year by The King’s Gap / Curzon Road. I would really not like Hoylake too look like Parkgate but I think it is now unlikely. As we all know Hoylake is built on sand dunes and I now think the best and only sustainable answer is probably to let sand dunes develop as would happen naturally. The beach would gradually move seaward just like it has near Red Rocks as dunes develop on the thin strip of marsh grass there. I think the conditions at Hoylake with an open sea rather than estuary location with its huge sand deposits mean that it is quite different from Parkgate which is well up the estuary, siltier and less windy and of course Parkgate suffered more directly from the artificial shift of the Dee from the English to the Welsh shore. The Hoylake beach levels are now so high and the silty channel in front of North Parade which provided the greatest saltmarsh potential has all but gone so the sand is coming and I don’t see that it is stoppable! I wonder how often does the tide make it all the way to the sea wall between Beach Road and the old baths site these days? It can’t be that often with such raised beach levels. Dunes are a wonderfully attractive habitat and would be a lovely reversion to how Hoylake would be naturally and provide a line of natural “soft” sea defences and a great place for recreation and wildlife with a beach in front of it. Those are my thoughts anyway. I think some radical thinking and a well informed public debate would be a good thing. What do others think? Does anyone know what happened to that consultancy report for the Council a few years ago? There was a Consultation with the Residents on the Prom and others with Cllrs , about a year ago, and they decided the Spartina was to be sprayed to remove it but it has not been too successful as we can see. They were also adamant that we should try to keep the sand especially as the Sand Yachters now come from far and wide. There was another report, this one on windblown sand and habitat change not Spartina, on the Wirral MBC website. 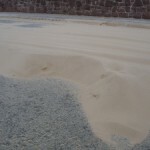 The windblown sand report is no longer there but there is a long summary here http://www.wirral.gov.uk/LGCL/100006/200073/670/content_0001005.html . However, it conveniently omits the detailed recommendation for a trial to promote natural dune development which was apparently rejected by the council. The big sweeper truck (what do you call them?) was down on North Parade again today …doesn’t seem to be having much effect to me. It’s hard to see the council being willing to clear up everytime it happens though I’m not sure what the best solution is. If dunes are the solution then do they have to start off as man-made? 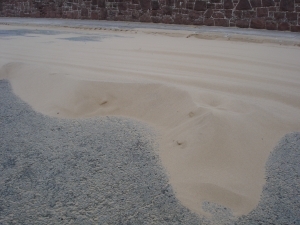 Normally dunes build and vegetate themselves quite happily but in this case the sand is blowing onto the prom which if left would in just a few years disappear under dunes. Clearly that is not desirable! 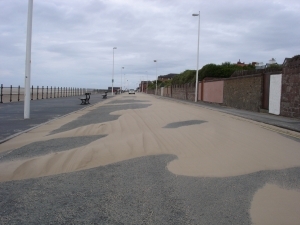 Therefore the challenge is to stop as much of the sand as possible before it gets on to the road. This is normally done by use of brush fencing, old fashioned split chestnut & wire fencing, etc to create sheltered compartments where thesand can drop. Planting dune grasses helps to ‘fix’ the dunes more quickly than leaving them to nature although they are a fragile habitat at the best of times. The report referred to above suggested testing the idea at the bottom of Beach Road and the beach from there towards The King’s Gap since these areas are where the sand has accumulated highest. When I was a kid we had to climb up the nearly 6 foot wall at the bottom of Curzon Road but now you literally step off it onto sand. Once established they’d gradually migrate seaward until a natural equilibrium was reached and they would have a nice sandy beach along their length.